In this article Steve Smith explains why a production environment is always in a state of near-failure, why optimising for robustness results in a brittle incident response process, and why Dual Value Streams are a common countermeasure to failure. An organisation that optimises for robustness will attempt to maintain a production environment free from failure. This approach is based on the belief that failures in IT services are caused by isolated, faulty changes that are entirely preventable. A production environment is viewed as a set of homogeneous processes, with predictable interactions occurring in repeatable conditions. This matches the Cynefin definition of a complicated system, in which expert knowledge can be used to predict the cause and effect of events. This underinvestment creates an inoperable production environment, which makes it difficult for operators to keep IT services in a safe and reliable functioning condition. This will often be deemed acceptable, as production failures are expected to be rare. A production environment of running IT services is not a complicated system. It is an intractable mass of heterogeneous processes, with unpredictable interactions occurring in unrepeatable conditions. It is a complex system of emergent behaviours, in which the cause and effect of an event can only be perceived in retrospect. As Richard Cook explains in How Complex Systems Fail, “the complexity of these systems makes it impossible for them to run without multiple flaws being present“. A production environment always contains partial faults, and is constantly in a state of near-failure. A failure will occur when unrelated faults unexpectedly coalesce such that one or more functions cannot succeed. Its revenue cost will be a function of cost per unit time and duration, with cost per unit time the economic impact and duration the time between start and end. Its opportunity costs will come from loss of customer confidence, and increased failure demand slowing feature development. For example, at Fruits-U-Like a third party registration service begins to suffer under load. The website rejects new customers on checkout, and a failure begins with a static cost per unit time of £80K per day. A lack of telemetry means the operations team cannot triage for 3 days. After triage an incident is assigned to the checkout team, who improve connection handling within a day. The Change Advisory Board agrees the fix can skip End-To-End Testing, and it is deployed the following day. The failure has a 5 day repair cost of £400K, with a detection sunk cost of £240K and a remediation opportunity cost of £160K. After a failure, the assumption that failures are caused by individuals will lead to a blame culture. There will be an attitude Sidney Dekker calls the Bad Apple Theory, in which production is considered absolutely reliable bar the actions of a few unreliable employees. The combination of the Bad Apple Theory and hindsight bias will create an oppressive culture of naming, blaming, and shaming the individuals involved. This discourages the sharing of operational knowledge and organisational learnings. 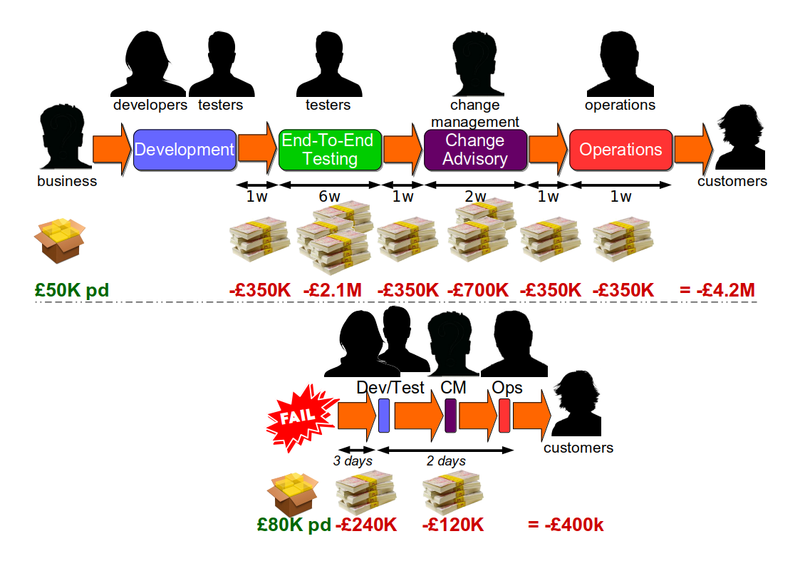 An organisation optimised for robustness will be in a state of Discontinuous Delivery. Attempting to increase the Mean Time Between Failures (MTBF) with practices such as End-To-End Testing will increase feature lead times to the extent that business demand will be unsatisfiable. However, the rules for deploying a production fix will be very different. When a production fix for a failure is available, people will share a sense of urgency. Regardless of how cost per unit time is estimated, there will be a recognition that a sunk cost has been incurred and an opportunity cost needs to be minimised. There will be a consensus that a different approach is required to avoid long feature lead times. Dual Value Streams is a common countermeasure to failure when optimising for robustness. For each technology value stream in situ, there will actually be two different value streams. The feature value stream will retain all the advertised pre-production risk management practices, and will take weeks or months to complete. The fix value stream will strip out most if not all pre-production activities, and will take days to complete. At Fruits-U-Like, that means a 12 week feature value stream from code to production and a 5 day fix value stream from failure start to end 2. Dual Value Streams signify Discontinuous Delivery, but they also show potential for Continuous Delivery. The fix value stream indicates the lead times that can be accomplished when people have a shared sense of urgency, actively collaborate on releases, and omit the risk management theatre.